Cement Roadstone chief executive Liam O'Mahony took home €1.6 million. o 7.2% - the total wage increase agreed under Sustaining Progress for 26-County workers. The increase was to be spread over 18 months. o 25.4% - the consumer price index measured increase in water, refuse and other service charges over the past year. o 14% - the same index measured increase in electricity costs over the last year. o 11.3% - the average increase in house prices over the 12 months to the end of March as measured by Sherry Fitzgerald. o $15.09 (€12.25) - the average hourly cost of a manufacturing worker in Ireland. o $20.18 - the European average hourly cost of the same worker. o 10% - the average salary increase paid to Cement Roadstone executive directors in 2003. 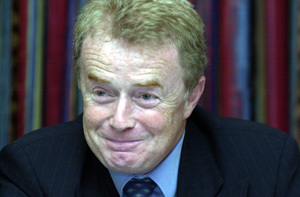 Chief executive Liam O'Mahony (pictured) took home €1.6 million. o 43% - the wage increase for Irish Nationwide chief executive last year. Micheal Fingleton took home a total package worth $1.2 million compared to €835,000 in 2002.
o 50% - the increase in the pay and perks package of AIB chief executive Michael Buckley last year. Michael got a basic pay of €660,000 plus a bonus of €570,000 and €69,000 in pension contributions. o 300% - the remuneration increase awarded to Michael Chadwick, executive chairman of the Grafton the building materials group. Last year, Chadwick waived nearly two thirds of his wages. This year he took home €712,000.